Green tea is packed with healthy antioxidants and may help reduce heart-disease risk, manage blood sugar and boost weight-loss, according to the University of Maryland Medical Center. Despite the potential health rewards, however, drinking too much green tea can cause unpleasant -- or even dangerous -- side effects. For your health, limit green tea intake to five or fewer cups per day. Green tea is a caffeinated beverage and may cause side effects such as rapid heart rate, upset stomach, restlessness, anxiety, insomnia and tremors. 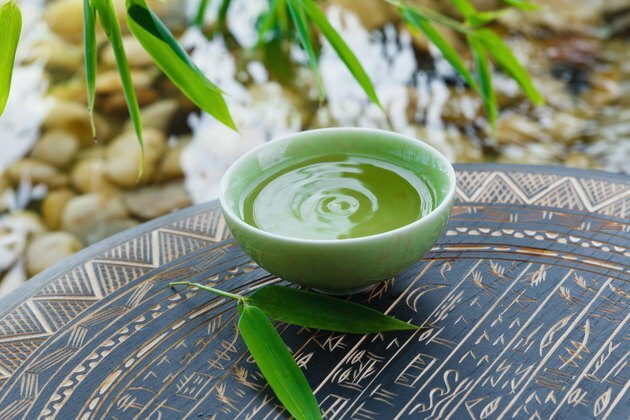 If you drink green tea regularly, your body may grow dependent on caffeine and you may get withdrawal symptoms such as irritability, drowsiness and headaches if you stop. Caffeine content varies by product, but green tea from one major brand contains about 35 milligrams of caffeine per brewed bag. Drinking 200 to 300 milligrams of caffeine is moderate consumption, although you may have side effects with less if you're sensitive to the substance. Tea contains antioxidants called flavonoids, which may have a protective effect on your health. Flavonoids, however, bind with nonheme iron -- the main type of iron in plant foods such as beans, fruits and vegetables -- and prevent your body from absorbing it. Drinking green tea at mealtime can reduce iron absorption by about 70 percent, according to the Linus Pauling Institute, so you may be better off limiting tea to between-meal sipping. If your dinner just isn't complete without a cup of tea, add a squeeze of lemon to help reduce the iron-binding effect. If your green tea comes from a bottle -- or if you use a heavy hand with the sugar or honey -- you may end up swallowing an unhealthy number of calories. Consuming more calories than you burn leads to increased body fat, so loading up on sweeteners can be dangerous for your waistline. While plain green tea has zero calories, bottled versions may contain 30 to 90 calories per cup. In addition, every teaspoon of sugar in your teacup will add 16 calories to your drink. Although green tea is typically safe, drinking too much -- or any at all, in some cases -- may worsen some preexisting medical conditions. For example, people with anxiety may grow more anxious, and those with diarrhea may experience greater bowel trouble. Green tea may also be unsafe if you have anemia, glaucoma, a heart condition or bleeding disorder, according to MedlinePlus. If you have these or any other medical condition, speak to your doctor about how much green tea you may be able to tolerate.